Don't spend your time looking for a service project that will aid hundreds of individuals simultaneously. Just one act of service will make a difference. It can brighten someone's day and you never know the chain reaction it can create. 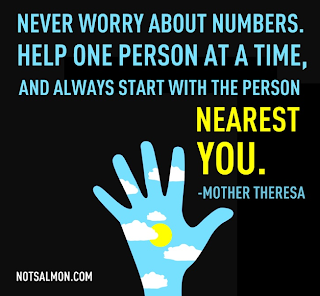 In this quote by Mother Theresa, she reminds us to serve, even if it is one person, and always start with the person nearest to you. Often, the closest person to you is the individual you can touch and help the most. These individuals are the ones you know the best and you can influence their lives for good. Don't let these opportunities to serve pass you.